Parkhotel Frank – Five stars for zest for life! 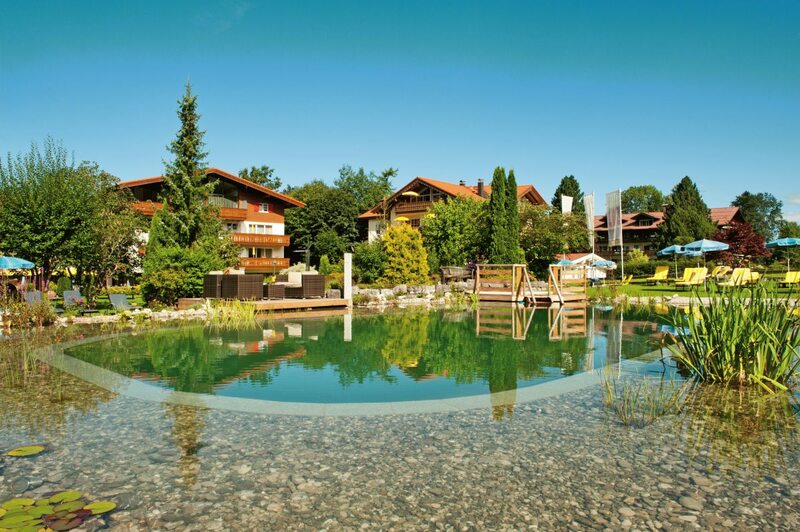 Elegant Parkhotel Frank, a family owned and managed Leisure and Wellness Hotel is the Southern Most 5-star hotel in Bavaria’s beautiful Allgäu region located in the village of Oberstdorf and will not leave you with any wish not being fulfilled. ... in an atmosphere filled with joy, warmth and style. The mountains surrounding the hotel along with the „premium class“ healthy climate combined with culinary delicacies and a brand new SPA highlight will create a pleasant and memorable holiday experience. Parkhotel Frank with its 81 rooms is situated at the southern edge of Oberstdorf village center – with an incredible view of the mountains surrounded by a spacious garden with natural pool and greens. A magnetic location for summer guests! If you enjoy nature, outdoor activities or if your preference is a relaxing treatment for body and soul, let us pamper you! You will enjoy the wonderful panoramic mountain views of the Bavarian Alps, the countless, attractive hiking and mountain bike trails ideally prepared for all levels of expertise. The region Oberstdorf/Kleinwalsertal offers 6 mountain railways. Enjoy playing on exquisite golf courses or go downhill or cross-country skiing on the nearby tracks and slopes. At the hotel you will find a perfect rest in our newly designed SPA area „WellÉtage“ on 5,400 square feet with lots of space for relaxation and wellbeing: Your relaxation program may include an indoor pool (30 × 54 ft), sauna landscape, specially designated rooms for silence and peace, a wellness bar and a gym as well as a team of therapists for high quality SPA treatments. Regain energy from the magical nature of the Upper Allgäu region. By the way, the hotel is also a perfect spot for families. World famous sights including Neuschwanstein castle or UNESCO protected Lake Constance with its lake festival stage at Bregenz and the flower island Mainau are located not far away. Five stars for zest for life! No matter if you are a family or gourmet person, a fan for nature or SPA – Parkhotel Frank is a refuge for (almost) every need for a perfect holiday. Explore our world filled with zest for life … we are exclusive but yet down to earth. Here in Germany’s Southern Most 5-star hotel people who are visiting as guests but will leave as friends. 5 Star Parkhotel Frank in Oberstdorf is member of Allgäu Top Hotels.